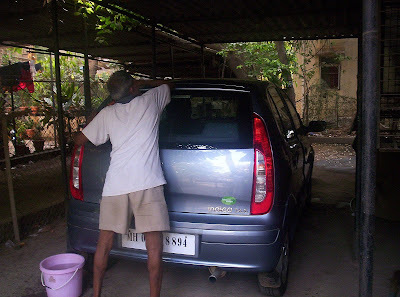 In Mumbai, carowners need not take their cars to the carwash, there are guys who come over daily to do the job! This is necessary because there is plenty of dust around, hence the cars need to cleaned daily. 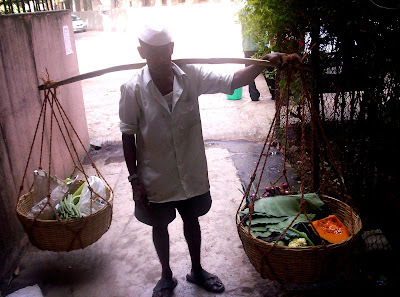 This is the 'Vasaiwala' (man from Vasai - a distant suburb of Mumbai) who traditionally has been a supplier of farm fresh vegetables from Vasai to residents of Mumbai, at their doorsteps. These guys would vend the fresh vegetables all over Mumbai. Now their number has dwindled drastically with the development of Vasai into a big township itself. 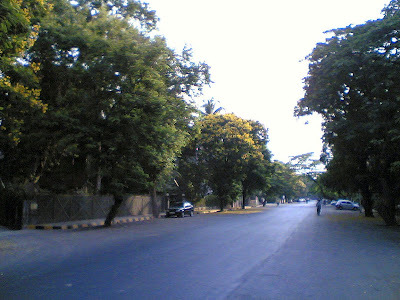 A street In MIG Colony in Bandra (East), gently wakes up on a quiet sunday suburban morning! 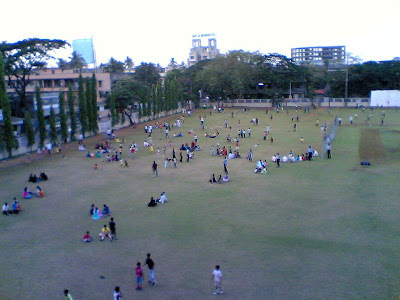 An evening at the MIG Cricket Club grounds. 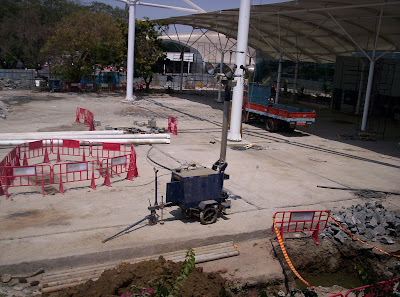 The cricket pitch can be seen on the right hand side. Infrastructure Leasing & Financial Services Limited (IL&FS) is one of India's leading infrastructure development and finance companies. 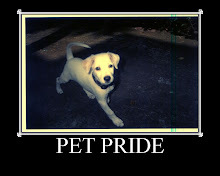 This is their image in BKC. 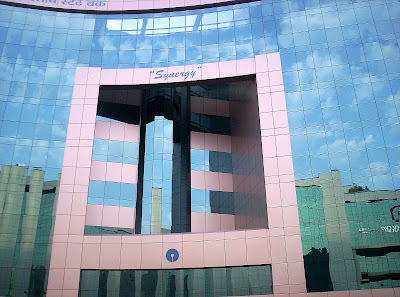 This is the SEBI building in BKC....more glass (maybe since they are all financially related so fragile!). 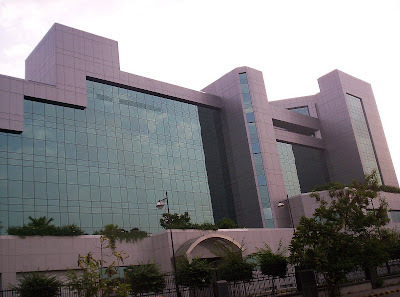 Securities and Exchange Board of India (SEBI) protects the interests of investors in securities and promotes the development of the securities market through appropriate regulation. 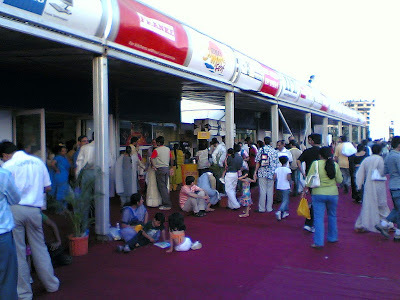 An exhibition of consumer goods on at the exhibition grounds in BKC. 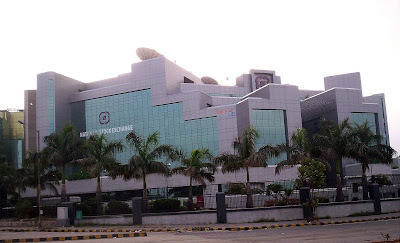 The State Bank of India building reflects the National Stock Exchange. 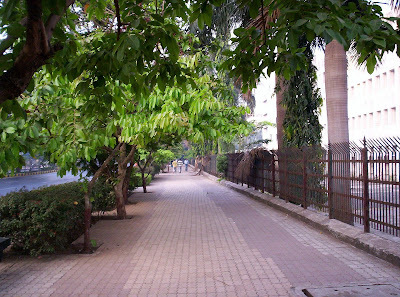 This is the pavement that is used for that invigorating morning or evening walk in the Bandra Kurla Complex. 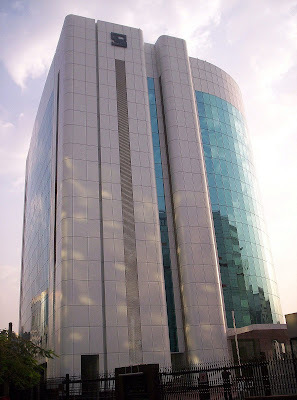 Another perspective of th National Stock Exchange building. I see all these buildings during my morning walk! 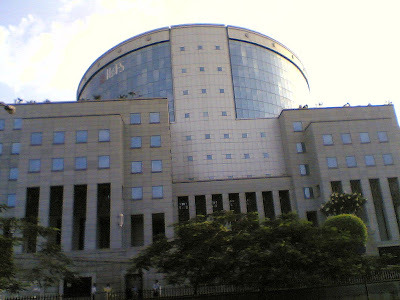 The National Stock Exchange building in the Bandra Kurla Complex in Mumbai. 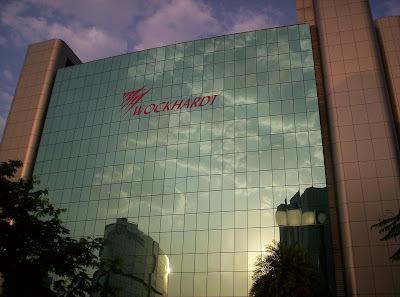 One of the corporate buildings in the 'Bandra Kurla Complex' now popularly known as BKC in Bandra (East) = the new destination for all corporate offices. 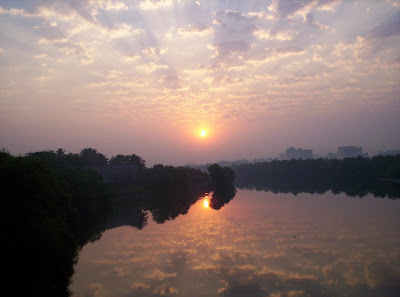 Sunrise over Mahim creek in Mumbai. The bridge over Mahim creek connects the suburbs to the city. The peltophorum petals fall to pave the streets with gold! The sweepers curse it every morning though! This is a familiar sight in most of Mumbai during summer. 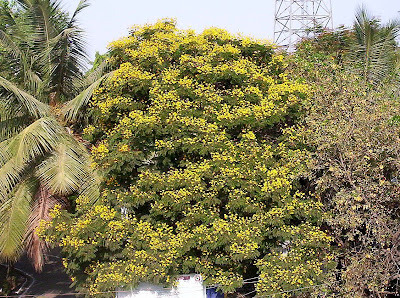 Peltophorum flowers in bloom all over Mumbai in summer. When these flowers fall, Mumbai's streets are paved with gold! 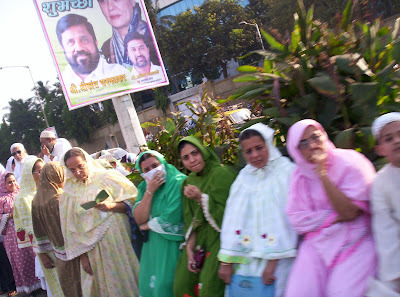 People belonging to the Dawoodi Bohra community waiting religiously all along the route from the airport for their religious leader Huzurala TUS to pass by. This is one end of the refurnished Terminal1B at Mumbai. Not crowded as not many flights scheduled to depart at this hour. 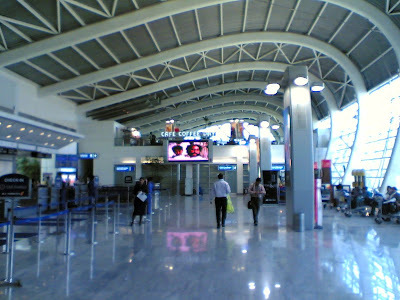 Terminal 1B of Mumbai airport for domestic flights undergoing a makeover after privatisation. Presently only the private carriers operate their departures from part of this terminal. All arrivals are in the Terminal 1A which was the departure/arrival terminal for 'Indian Airlines' now renamed as 'Indian' - a public sector enterprise for the domestic sector. 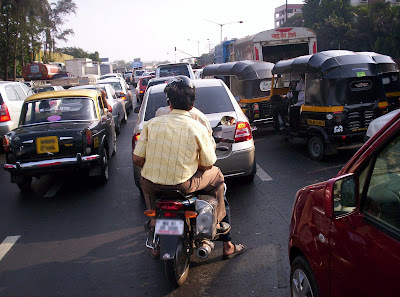 This is the scene all day at Vile Parle (a suburb of Mumbai) junction on the Western Express Highway. This is the result of frenetic activity in building a flyover to ease the traffic at this junction.